So there's a bunch of "knights" who think they're of king Henry's round table, traveling around a future America, and putting up street shows of valor... on motorcycles. It was directed by infamous master of the Dead, George A. Romero. It's also a joy to see legendary make-up artist Tom Savini in front of the camera, in one of his very first acting gigs. Stephen King is in there as an avid hillbilly fan. So is his wife. It's actually a pretty good movie! The surreal setting takes second place to a well written drama, brought forth by an incredible array of actors who never flinch at what they're asked to perform. 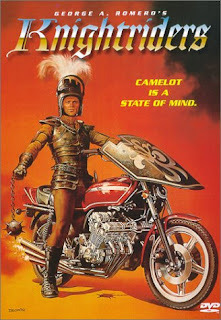 Oh yeah, I promise that there's no relation what-so-ever to Hasselhoff's latter craptastic Knight Rider.